You are probably wondering how it taste? It actually taste great. Of course it taste like cheesy cauliflower softer than a classic pizza crust but still crusty on the sides. I topped my crust with fresh tomato paste, flat button mushroom, grated mozzarella cheese and fresh basil leaves. Simple, quick, healthy and so tasty. 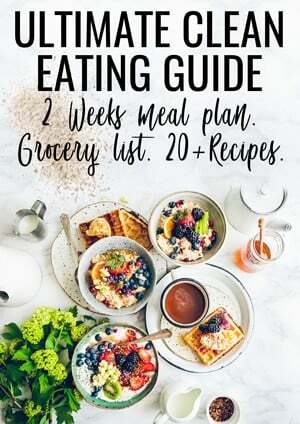 Another great idea to transform a usually unhealthy dish into a nutritious meal perfect for the whole family, even the small ones. Of course because it is a flourless pizza crust it is also a perfect gluten-free pizza crust option. 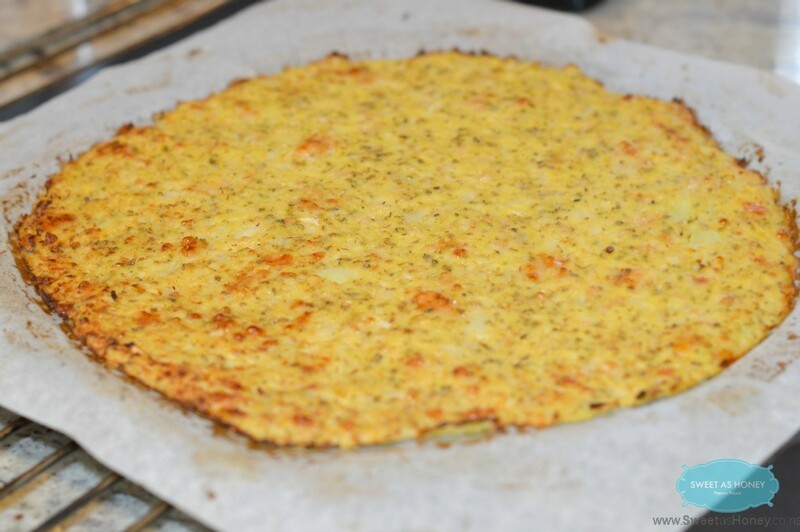 Cauliflower Pizza Crust is a delicious low carb pizza crust perfect for any occasion! Prepare a baking sheet covered with parchment paper. Spray some oil on top to avoid the crust to stick. Set aside. Place the half of the cauliflower florets into a food processor with the S blade attachment. Process for 30 seconds, stop, scrap drown the bottom and sides. Repeat for 30 seconds until all the florets are pulsed into a fine cauliflower rice - it will looks like couscous/semolina. Transfer the cauliflower rice into a microwave safe glass bowl. Process the over half of cauliflower florets until pulsed into rice and transfer into the glass bowl. Cover the glass bowl with a microwave safe lid. Microwave for 5-6 minutes. Remove from the microwave with oven mitten - be careful it is super hot! Transfer the hot cauliflower rice onto a clean towel. Squeeze as firm as you can to release all the water. Again it is hot so use your oven mitten to avoid burning your hands. Open the towel, you should obtain a dry ball of cooked cauliflower rice. Transfer into a bowl, add spices, salt and cheese. Combine with a spatula. The cheese will melt and the cauliflower pizza crust is forming. 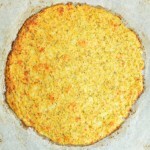 Press the cauliflower crust onto the prepared baking sheet. Press with your hands to form a round pizza. Bake for 15 minutes or until the borders are crispy. Spread your favorite pizza toppings like tomato sauce, vegetables and extra mozzarella cheese. Bake again for 15 minutes until your toppings are cooked and cheese is melted. I’ve been wanting to try cauliflower pizza crust forever and just simply haven’t gotten around to it. You have solidified I must make it and soon because this looks to delicious and too easy to not try! Thanks! I’m looking forward to trying this pizza crust. Thanks. It is really yum and you will be surprised by how it taste great 🙂 you will not believe it is made of cauliflower. Just made this and it is PERFECT!! I added some finely diced leeks since I didn’t have quite enough cauliflower after having used the rest to make cauliflower mash earlier this week. I also had more like 2/3-3/4 cup of parmesan. That is great! It is nice to read positive comments 🙂 Leek should taste good as well a must try for my next one. I recently tested broccoli instead of cauliflower and except the strange greenish color for a pizza it taste awesome ! Holy Smokes! Just made this for me and my husband (the man who refuses to eat veggies). Not only did he devour it, he asked when I could make more. Huge success, THANKS! Enjoy and see you around soon 🙂 Carine. Hi, have you ever froze this Pizza? If yes, what did you do with it after it came out of the freezer? Thanks. Hi, no I did not freeze it but I will recommend you to pre-bake the crust before freezing. Yes, sure any grated cheese works in this recipe. My favorite are mozarella, cheddar, emmental or edam. Hi. Can you make this without cooking the cauliflower? Hi, Unfortunately no. It won’t hold together. The cooked cauliflower is soft and the cheese stick to it creating the most delicious soft, crispy pizza crust when baked. Enjoy the recipe my friend. XOXO Carine. do you preface this? I dont see further instructions on this except the 3 ingredients and cooking califlower in microwave. Sorry there was an issue wih the recipe plugin not showing the recipe it is fixed now ! Enjoy the crust. XOXO Carine. Thanks for sharing my recipes! Carine.